Here comes Kevin. Walking into work late again after he left the pizzeria early last night. His co-workers are tired of him making them stay late, but he never seems to get in trouble. Could the addition of an employee handbook solve this problem? With an employee handbook in place, there's no arguing when it comes to vacation time, sick days and how many write ups it takes before a slacker gets fired. Without one, however, some pizzerias are taken over by aggressive employees who have a no-rules attitude. Many small business owners, including those running pizzerias like you, don’t feel there’s a need for an employee handbook. You may only have a few employees on staff, and everyone seems to follow the rules and get along. But, how are new employees trained? And what happens when questions about things such as maternity leave and disciplinary action arise? Handbooks do not need to be 40-page documents in order to be effective. 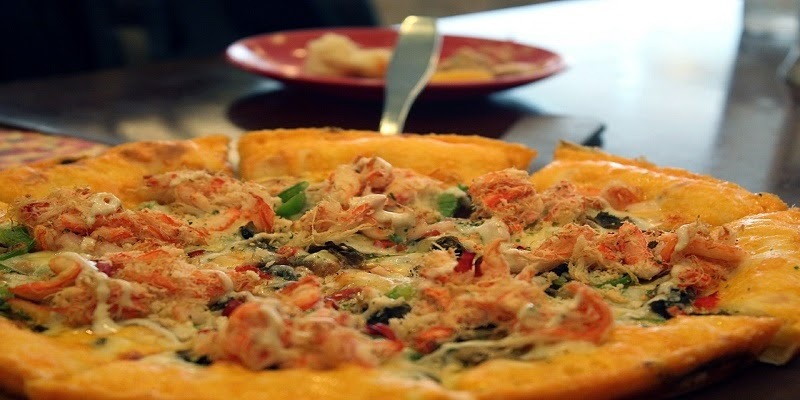 Customized handbooks explaining specific policies and procedures for your pizzeria can be less than 10 pages and still work just as well to protect your business from any legal issues that may arise. Believe it or not, your employees crave information when it comes to company policies. Employee handbooks should be considered a written agreement between you and your employees. It’s what you are providing to them, and what they are agreeing to in return. It’s an ever-changing document that should be updated as your pizzeria changes, and both new and existing employees should review it yearly. 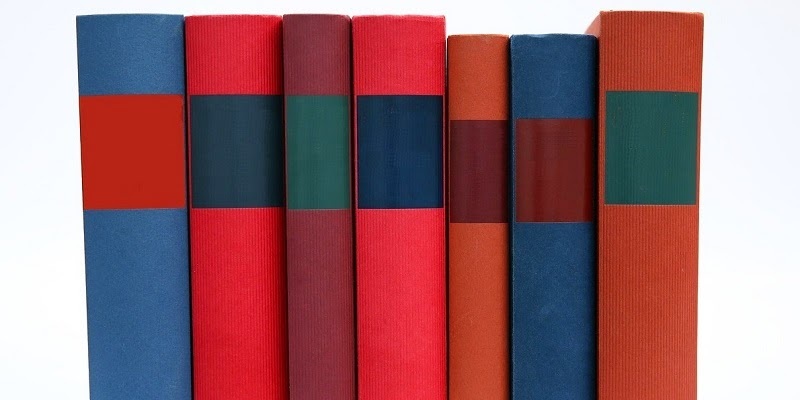 An employee handbook is more than just sick day and vacation policies. It can walk pizza makers step-by-step through the dough making process or show customer service personnel how to greet customers. It can be a road map to more profits for your business when used creatively. You undoubtedly have systems in place already; putting them in writing and ensuring that everyone is on the same page can only help to grow your business. While every pizzeria's handbook will be different, you will want to introduce the book with a letter from the owner or manager, welcoming new employees and/or explaining the concept of the handbook and why you feel it’s important. For the bulk of the handbook, start by compiling a list of your pizzeria’s problem areas and putting these topics up front. Do you have issues with tardiness, dress code, etc.? Focus on these topics first and foremost, and add the supplemental topics, such as sick and vacation time, last. In between, go over the systems and operations that are most important to your pizzeria. There are tons of employee handbook examples online that you can download and customize to your needs. A simple online search will turn up more than you’ll ever need; but be cautioned that most of these will be very generic. In addition, you'll want to seek legal assistance when it comes to drawing up forms for your handbook that include disclaimers about at-will employment; equal opportunity employment; non-harassment/non-discrimination complaint procedures; and an employee’s signed acknowledgment of receiving the handbook. Creating and maintaining an employee handbook does not have to be a daunting task. They’re designed to make your life easier by protecting your pizzeria and your employees, while also helping to ensure consistent systems and operations. If you don’t already have one, consider how it can change the dynamic of your business, and if you have one that hasn’t been updated in a few years, now’s the perfect time to refresh it. Do you have an employee handbook? Tell me how it helps your pizzeria in the comments below. 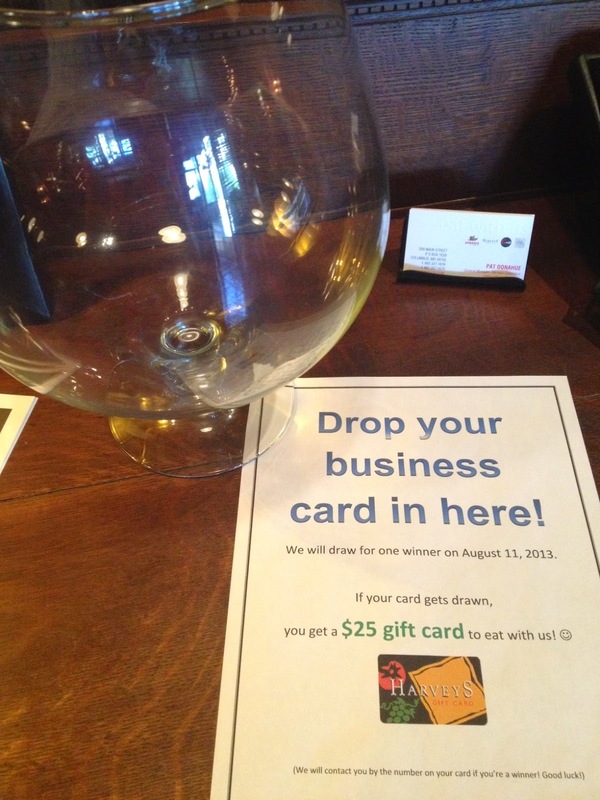 You know those glass bowls you see at restaurants asking customers to "Drop a card for the monthly drawing?" When used properly, they can actually double your business in a matter of weeks. Now hear me out. Try this idea for three months (the way it's outlined here), and you'll become a believer. Here are some examples of what we usually see. Do you notice anything missing? In the first example above, I'm wondering, "When will I 'stand' to win the free meal for 2?" Is this just a way for them to collect my information? How do I know that the drawing will ever happen? In the second example above, I'm left to ponder what the actual prize is. It seems like a lot of people have entered for this mysterious "prize," but what is it? Is it lunch, dinner, a new car? I'd be more inclined to drop my card if I knew what I had the chance to win. In this example, Lucky B's tells entrants precisely what they are entering to win (a free private party for up to 100 people and Lucky B's apparel), plus they tell you how often they choose a winner (every week). I also like the use of an opaque box here so you don't know how many other people you're up against. At Harvey's, they tell you exactly what you will win (a $25 gift card), exactly when they will choose a winner (August 11), and exactly how they will reach you (the phone number on your business card). 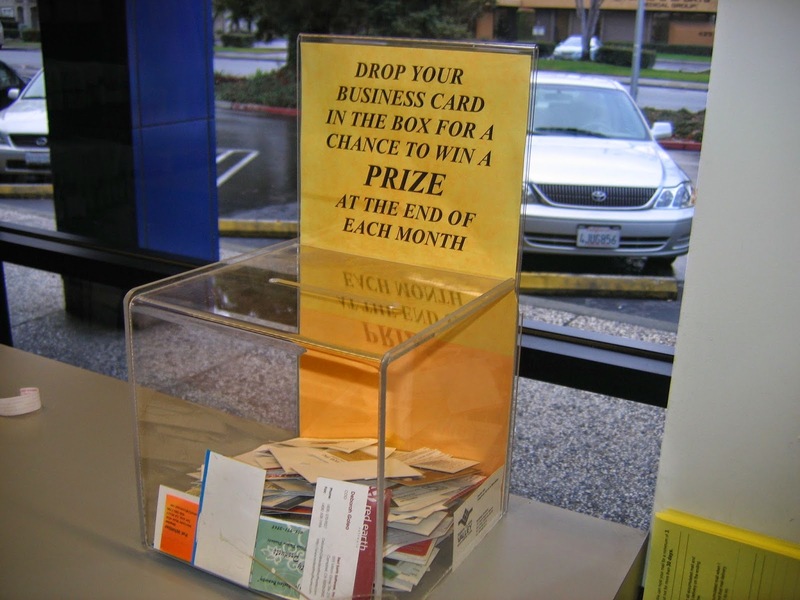 When it comes to business card drop contests, there are some basic rules that will lead to you growing your business. 1. Provide more information. The more information you provide to contest entrants, the more entries you will receive. Most people want to know what they are getting, and when they can expect it. 2. Have more winners. No one wants to wait a month, so the faster the giveaway, the better. Don't be afraid to run weekly, or even daily, contests, depending on your store's traffic. 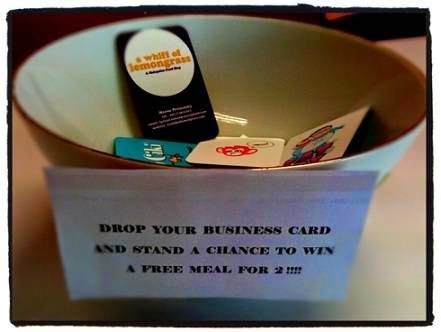 Give away a free lunch every Friday by announcing it on the jar: "Free lunch drawing every Friday at 10 a.m.!" Contestants will know by 10:15 a.m. if they won or not. 3. Announce the winner. Posting last week's winner on the bowl and social media is a great way to show customers that your contest is real, and get them excited about entering. 4. Give consolation prizes to all entrants. Once you collect all of the cards, don't just pick one big prize, send menus and a "special discount for entering" to every person who entered. You'll be surprised at how many people are excited to use their consolation prize. This tactic is one of the easiest ways to build your customer database and reach out to individual customers and businesses (which can become longtime catering customers). Will you try a business card giveaway in February? I want to see photos and hear results! Contact me at liz@pmq.com or comment below. 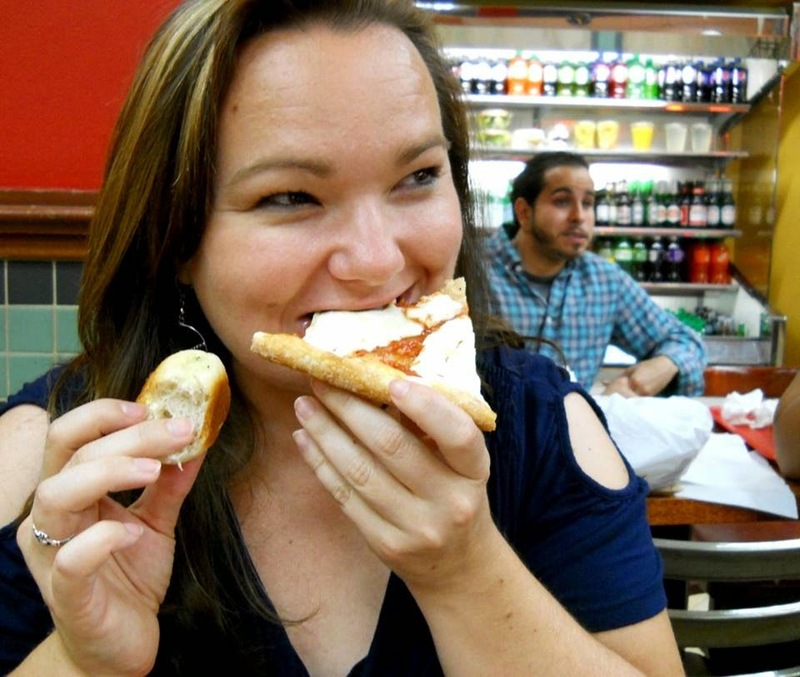 As an editor at a pizza magazine, I've seen some pretty bad photos come in from pizzerias over the years. It's not always their fault. Many times operators are dealing with poor lighting, metal counter tops that put off an unappetizing glare, and old-school cameras that don't help the matter. What you may not realize is that you already have a personal stock image library--and a bevy of free photographers--at your fingertips. All it takes is a bit of searching online. With proper permission and attribution, you may be able to use customer-snapped images in your marketing materials, social media and more. 1. Search Online: How many times do you spot customers taking photos of their food? Personally, I've taken hundreds of food photos. Where do all those photos go? They usually end up on Facebook, Twitter, or Instagram. Plug your pizzeria's name into various social media sites, or better yet, do an image search using the pizzeria name on Google. Once you find the photos you like, reach out to the photographer for permission. 2. Free Photo Shoot: Easier than searching is simply asking for photos. Place a tent card on each table letting customers know that if they use a specific hashtag in their photo and you feature it online, they'll win a prize. Instant photo shoot! 3. Photo Contests: Keep the photos coming in by running ongoing photo contests through your social media channels. Change up the theme each week to keep things interesting and get you different photos (Best Pizza photo, Best Friends and Pizza photo, Best Pizzeria photo, etc.). Let entrants know that the photos they submit may be used in future marketing materials. Have you used customer-snapped photos in your marketing materials? Tell me about it in the comments below. There are any number of reasons you may be looking for a pizza crust alternative that is gluten free. You could be catering to Celiac sufferers, those looking for a "lighter" choice, or just interested in testing out something new and different. Much like the Cauliflower Crust Pizza I talked about a few months back, the recipe here will show you how to make a pizza crust using spaghetti squash. 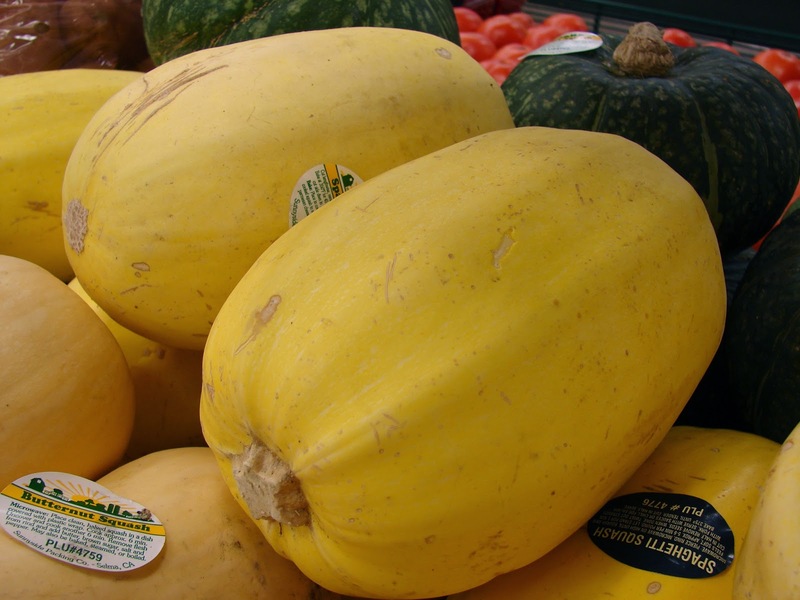 I actually just started experimenting with spaghetti squash about a month ago. I kept hearing people rave about how it was a great substitute for pasta, so I finally gave in and tried it. My favorite way to eat it so far has been with a heaping ladle of homemade chili on top (a la chili spaghetti). It's surprisingly filling and doesn't give me that overfull feeling that pasta has a tendency to do. So when Jesse Parenti, the hospitality director at Stratton Agency, told me that he makes pizza crust using spaghetti squash, I was intrigued. I haven't tried this recipe out for myself yet, but I wanted to share it with you as quickly as possible so you can take full advantage. Please send me photos if you create one (liz@pmq.com)! 1. Preheat oven to 400. Line pizza pan with parchment paper (DO NOT skip the parchment paper!). Set aside. 2. Press spaghetti squash in a strainer to remove any excess moisture (or use cheesecloth). This step is very important. 3. In a large bowl, combine spaghetti squash, mozzarella cheese, Parmesan cheese, egg, egg whites, garlic, and spices. Mix together until combined. 4. Let sit for a few minutes. Pour out any water on the bottom of the bowl. 5. Press the squash mixture evenly into the prepared pizza pan (a cookie pan works, too). 6. Bake at 400 degrees F for 15 minutes, until crust appears dry. 7. While the crust is baking, saute the mushrooms and onion in a fry pan until mushrooms are soft and onions are translucent. Remove from heat. 8. Remove pizza crust from oven. 9. Spread the pizza sauce over the crust. Spread your onion and mushrooms over the sauce. 10. Top with the mozzarella cheese. 11. Return to 400 degree oven and bake another 10 to 15 minutes or so or until cheese is bubbly and edges of crust are browned. 12. Let sit for about 5 minutes before cutting. You can use the parchment paper to slide it off the pan to make it easier to cut. I always love the start of a new year. It's when I start a new calendar, clean out my files and desk, and take a hard look at the direction of my work. It's the perfect time for deciding whether to change direction or firmly stay the course. With that in mind, here are five easy new year's resolutions for every business in 2015. 1. Plan ahead more. If you spent the past year flying by the seat of your pants, make the effort this year to plan meetings, events, promotions, emails, social media posts, and more further in advance. You'll be pleasantly surprised at how much time you save in the long run, and how organized life feels. 2. Join a networking group. There's nothing like being surrounded by other business people to spark new ideas, and every community has something such as a chamber of commerce or other similar group. Enjoy the time spent bouncing ideas off of other like-minded individuals, and eventually you may even partner up for a new promotional idea. 3. Give more. It feels good to give back to your community, and customers enjoy supporting businesses that they see are doing their part. Check into donating surplus food to nearby shelters, running canned food drives, donating a portion of proceeds for the night/week/month to a charity you hold in high regard. Involve everyone in the effort to make the most impact. 4. Support local businesses. It can be hard to get everything you need from local suppliers, but if customers see that you're making the effort to purchase fruits and vegetables from a nearby farm, or getting your milk and butter from the dairy in the next town, it will reinforce your love for the local community. 5. Do more delegating. I'm guilty of this one myself. So many times I think that things will get done faster if I just do them myself, but no one person can do everything. Imagine how much your business could achieve if you just handed off a few of your daily/weekly tasks to someone else? Life won't end if something isn't perfect the first time around. Correct the mistake if it happens, and move on. The free time you'll gain to work on other tasks is priceless. What are your business resolutions for 2015? Tell me about them in the comments section below!